Jolly Roger Games | SPACE-BIFF! It’s sobering to dwell on just how close we came to annihilating ourselves. And if nothing else, 13 Days absolutely captures the sense that the warning lights are on, the lid has been flipped back, and that red button is staring you in the eye, waiting to unleash the end of the world. When in doubt, attack Geoff. All excellent advice. Truly, Sun Tzu was wise in the art of war. Pirates. Dinosaurs. Still At It. A week ago, I wrote something that might have come across as a bit mean. I know, I know. Sometimes I disappoint even myself. In the comments after my review of Richard Launius’ Defenders of the Realm: Battlefields, I voiced a theory that perhaps Mr. Launius is a bit of a prodigy when it comes to designing cooperative games — after all, he’s been involved in some pretty impressive projects, like Arkham Horror, the original Defenders of the Realm, Elder Sign, and even the Infernal Relics expansion for Sentinels of the Multiverse — but that he might not be quite as adept at crafting interesting competitive games. 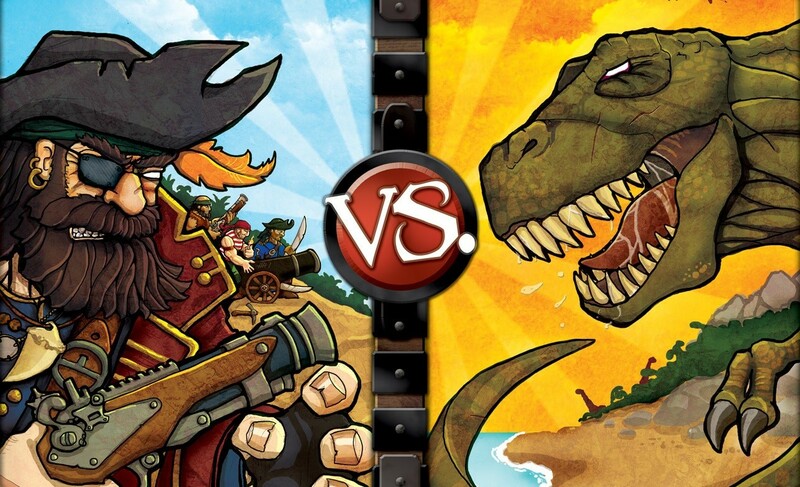 Well, today we’re looking at his newest game, Pirates vs. Dinosaurs, and I’m going to be eating my words. Or at least some of them.